The journal Plant Reproduction (PR) is the official journal of IASPRR. Dolf Weijers, Laboratory of Biochemistry, University of Wageningen, The Netherlands. Impact Factor (2016): 2.629. 5-Year Impact Factor 2.937. 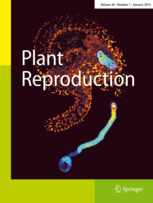 Plant Reproduction (known as Sexual Plant Reproduction until the end of 2012) is a journal devoted to publishing high-quality research in the field of reproductive processes in plants. Article formats include original research papers, expert reviews, methods reports and opinion papers. Studies in model organisms where mechanisms of reproduction can be supported by genetic or biochemical evidence are strongly encouraged. Science Citation Index, Science Citation Index Expanded (SciSearch), Journal Citation Reports/Science Edition, PubMed/Medline, SCOPUS, EMBASE, Chemical Abstracts Service (CAS), Google Scholar, EBSCO, CAB International, Academic OneFile, Academic Search, AGRICOLA, Biochemistry and Biophysics Citation Index, Biological Abstracts, BIOSIS, CAB Abstracts, Current Abstracts, Current Contents/ Agriculture, Biology & Environmental Sciences, Current Contents/ Life Sciences, Elsevier Biobase, EMBiology, Gale, OCLC, SCImago, Summon by Serial Solutions, VINITI - Russian Academy of Science.